The sun was already well above the horizon as we sat in our truck waiting for our fishing buddy to arrive. The nearby campground was busy with campers finishing up breakfast and attending to the necessary chores before going off to fish. The weather was warm and only the slightest breeze was perceptible. A great hatch was sure to be in store for us this day! The wait was brief and shortly, my fishing buddy stepped out of his truck with a friend...a dog. 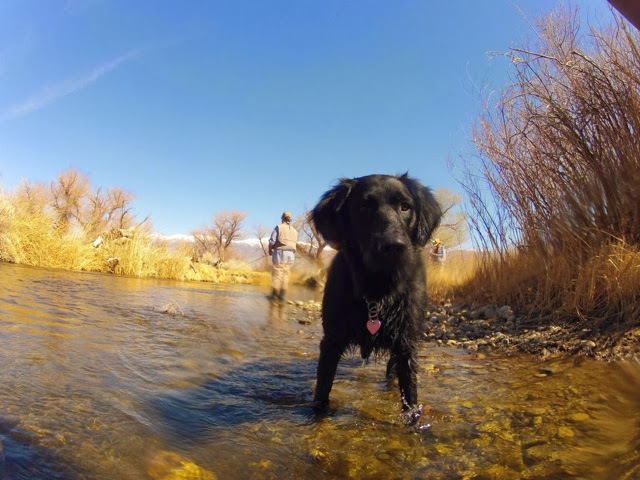 She was a beautiful flat coat retriever, and as black as midnight. At about a year and a half old, she had boundless energy and after a short period of initial shyness, she warmed up to us all and was ready for any adventure the day had in store. Along the shore, she played with boundless energy and surprisingly, did not distrupt the fishing. Her interest was captured by the many sticks that floated along the banks and she made short work of them, thowing them high in the air only to be easily caught on the way down or crunching them into oblivion right where they lay. Watching her was pure enjoyment. My son's first take was a beautiful 12 inch rainbow from the shallow riffles and our friend didn't seem to care. She was much more focused on those wiley sticks! Dogs can be such good companions while fishing, especially when they are well trained. They bring a comic relief to the day that is unsurpassed!